EMERALD ISLE — The past two months have delivered winter weather to coastal North Carolina full of cold temperatures, freezing rain, sleet and even some snow. Snow is rare enough along the coast that locals become giddy at the sight of an overlay of the white powdery stuff decorating the dunes and marshes. I must admit that I like a Carolina snow and I always head out for long hikes to enjoy the unusual scenery before it quickly melts away in a day or two. Snow events are a good time to go out and look for birds as they are a bit more conspicuous against the white background and they are a little more tolerant of humans as they scramble to find food. 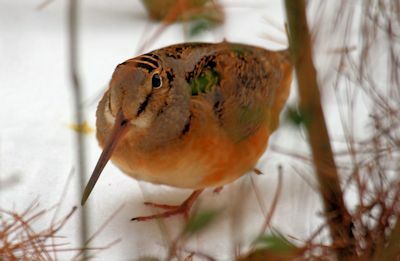 A covering of snow and ice can make it difficult for the birds to locate enough food to keep their metabolic rate high enough to stay warm while maintaining their fat reserves. Birds are well protected from the cold by the insulation capabilities of their feathers, especially when the feathers are puffed out to prevent heat from escaping. When it’s really cold, they will sit down to prevent heat loss and their muscles will also shiver to create heat. Some birds will even huddle together at night to stay warm. As I headed out on my hike, I was quickly startled by two woodcocks that bolted from the ground and into the gray morning sky. I continued on and soon flushed two more woodcocks, then a few more and within a quarter of a mile I saw about a dozen of these masters of camouflage. The cryptic pattern of their brown, black, rust and gray colored feathers was useless against the white ground cover and I was spotting them everywhere. They were probing their long bills into any available patch of bare ground looking for a meal. Cedar waxwings are handsome birds. The birds raise their slick backed crest when annoyed. One of the birds walked into a shrub thicket to elude me but I headed in after it to try to get some photographs. The bird effortlessly darted around the trunks of the small trees like a slalom snow skier while I was being scratched and poked as I pushed through the branches. It finally stopped and hunkered down by a small wetland that wasn’t completely frozen. I found a spot and did the same, sitting on the mixture of sleet and freezing that was as hard as concrete. Amazingly, the woodcock started walking right towards me and stopped about ten feet away behind the base of a small live oak tree. It stepped out from behind the tree a couple of times to look at me and I was able to get a few quick opportunities for a picture. The uncomfortable sitting situation encouraged me to leave the thicket and unburden the woodcock of my presence. Over the next few days, I would see close to a hundred woodcocks. I have never seen so many over such a short period of time, and assumed, since woodcocks migrate early, that this flock of birds was already heading north. I popped out of the dense brush and hiked over to the edge of another wetland where an opening in the vegetation offered a commanding view. Across the way, a great blue heron was protected from the wind on the leeward side of a large live oak tree. It sat motionless, with its head and bill buried into its breast feathers to ward off the cold. Out of the reach of predators, this beauty rested without a worry. A small flock of American robins flew in and settled on the bare gray branches of a dormant tree giving it the appearance of instant leaves. A few of these birds were quickly drawn to a small opening where the water had not been completely glazed over with a crust of ice and immediately dipped their beaks into the cold liquid. As I watched the robins quench their thirst, I heard numerous high pitched whistling sounds fill the air. I turned around to discover a different group of birds adorning another naked tree. These frugivorous wandering birds of winter will usually always show up, unpredictably, to strip the trees of their fruit. The flock will work cooperatively to find an area with a number of fruit bearing trees, such as eastern red cedar or American holly, and the feast is on. As their name implies, they have a preference for the cedar berries. Not only do they work in sync to find food, but they help each other while feeding. 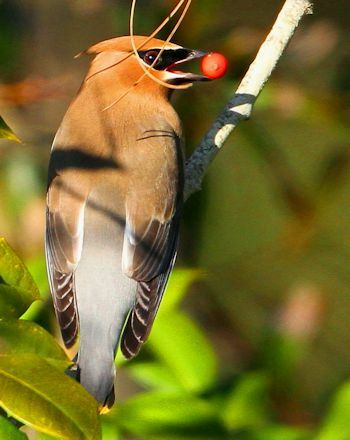 If a cluster of berries is difficult for the entire group of birds to reach, they will line up on a branch and pass the berries, beak to beak, down the line feeding each bird in the group. When the amount of fruit in an area is limited, small groups within the flock will feed in a rotation allowing all the birds an opportunity to feed. They indulge in the berries in more ways than one. Sometimes, after they have eaten berries as their only source of food, they will also get a buzz on. When weather conditions are favorable, the sugars in the fruit will ferment and turn into alcohol. After consuming these potent berries, the bird may be rendered inebriated, and at times, fall into a stupor until they sober up. High alcohol content has even been reported to kill a few birds. Once the fruit on the trees has been gobbled up, which may take a few days to a couple of weeks, they will then move on to another area and might not be seen again until next winter. During spring and early summer when fruit is not as readily available, they will survive on insects. During their abbreviated stay, it is irresistible not to enjoy their beauty and compassionate behavior. These stunningly attractive birds appear proper and dignified, yet, also with a bit of mystery. Their plumage has a soft, silky, velvety texture that blends a variety of colors creating an elegant looking creature. The light brown head is adorned with a slicked back crest that is only raised when the bird is annoyed. Its eyes are cloaked with a black mask outlined with a narrow white boarder. The breast is gray and tapers down to a whitish, weak yellow belly. The back is light brown that gives way to a gray tail and wings. They are accented with a luminous yellow tail band which is sometimes orange if the bird has been consuming fruit of an invasive honey suckle. Some of the birds also sport a few droplets of a dazzling red color on the end of their secondary feathers. 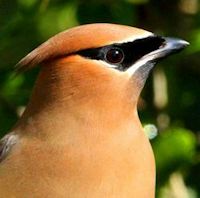 These spots are waxy, flattened extensions of the feather shaft and are the reason the bird is referred to as a wax wing. The color is due to a carotenoid pigment called astaxanthin. Both sexes will have the red drops, however, they will appear as the birds mature and increase with age, thus, young birds will not have the red color. Research suggests that the number of red drops relates to the age of the bird and will help them find a mate of similar age during the breeding season. The waxwings perched in the bare tree politely waited their turn and when the robins abandoned the watering hole, a few swooped in for a drink. As the last light of the day began to fade, I walked away from the wetland flushing a few more woodcocks, which delighted me as I made my way home.